The 'Signature' Cast Iron Shallow Casserole by Le Creuset. 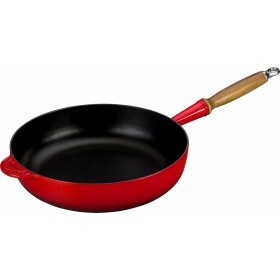 Cerise Red enamel finish with 30cm diameter. 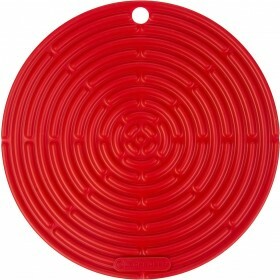 Wide flat shape and shallow sides ideal for risottos and simmering casseroles. Cast iron delivers even heat distribution and retention. 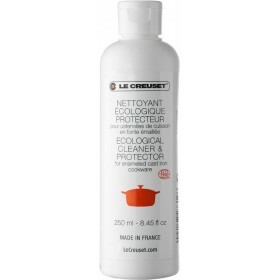 Easy to clean, toughened enamel interior. Heat resistant stainless steel knob. 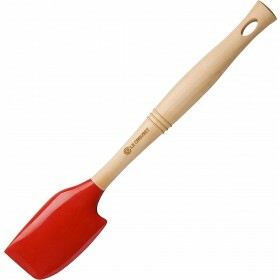 Suitable for all stove types including induction. Oven, grill and dishwasher safe. Perfect for a wide range of dishes from quick creamy risottos to tender, flavourful meat and vegetables or crisp, golden pies and tarts. The large flat shape and shallow sides of the Cast Iron Shallow Casserole make it perfect for browning meat and vegetables, simmering casseroles, stir frying, baking and serving at the table. Suitable for use on all stove types, including induction, and in the oven, the casserole makes a perfect serving dish too as cast iron keeps food warmer for longer at the table. 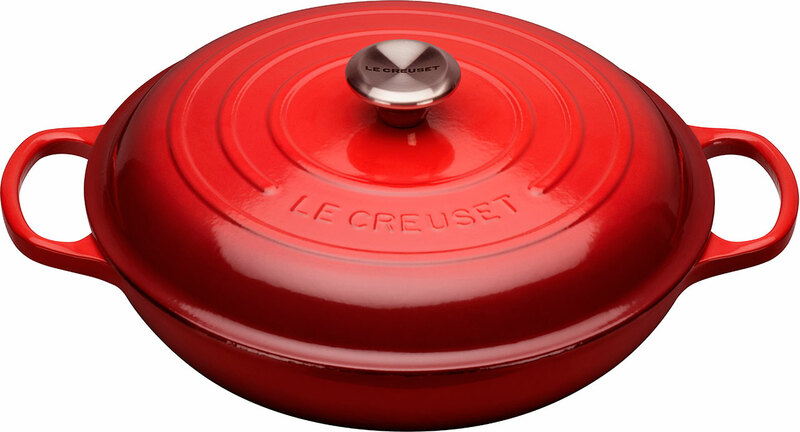 Individually cast in sand moulds and hand crafted at the original French foundry since 1925, Le Creuset cast iron pieces are protected by a Lifetime Guarantee for total peace of mind. temperature and optimum cooking conditions was a lottery. My new Creuset has delivered control ,consistency and contentment. I have used this a few times, grilling chicken, bolegnaise sauce and braised short ribs with great results. It's a really good size too and I love the heat resistant knob although you still need the oven mitt when you're slow cooking something for hours. Nice colour and cleans well, does need some scrubbing I've found with the things I cooked. Thank you for your speedy delivery and excellent prices. I placed my first order with your site a couple of weeks ago and received my Le Creuset buffet casserole in marseille blue a couple of days later. I have used it over and over again already! 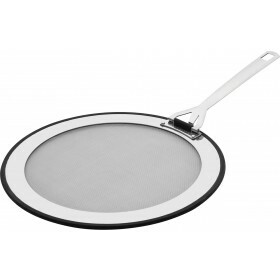 It's so good for everything from frying to poaching, making sauces and gently steaming veggies. It looks beautiful in my kitchen especially with the stainless steel knob, and retains the heat so well that it even makes cooking on the dreaded electric stove enjoyable!! 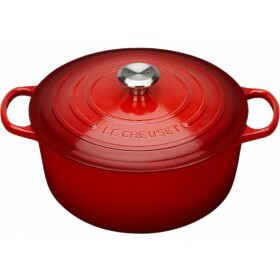 I have always coveted Le Creuset but have never been game to splash out on one...until I came across your store, which was such good value I finally could not resist! It truly was money well spent. Thank-you for making this home cook (and her partner) very happy and content! Add item to your shopping bag for a delivery estimate. Standard delivery – FREE on orders over $200 within Australia. Standard delivery – $8.90 flat rate, orders under $200 within Australia. Express delivery – cost varies according to your postcode. Sent from our Sydney warehouse with tracking. If you change your mind about your purchase from Teddingtons, we will provide a refund if you return the item within 90 days of receipt. Change-of-mind returns must be unused, unopened and in all original undamaged packaging. Teddingtons will pay for the return postage, however we charge a return postage fee depending on the weight of the item. For full details please see our return policy page. For full details please see our warranty information page.